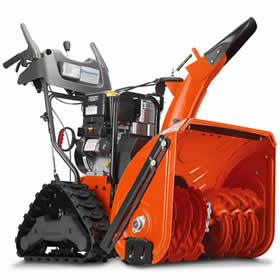 Looking For A Track Drive Snow Blower? I just noticed that Amazon has four Husqvarna 27 inch Track Drives left over from last year. If you have been looking for a snow blower that will chew through any type of snow including wind blown drifts these snow blowers will do the job! These machines have a huge 414 cc LCT engine and are over powered to the point that you just can’t slow them down. The 4 position height control will let you push through drifts like no other snow blower. I have been using the 30 inch version of this machine and in 2 years I have only had to change one shear pin and adjust the tension on the hydrostatic drive belt once. Here is a video of the 30 inch in action. The price shown on Amazon includes free shipping to your home. The snow blower comes in a crate and it takes only about 45 minute to take it out of the crate and set it up. Once you get it be sure to call the 800 number in the manual to register the warranty for the machine and you are good to go! Here are two articles I wrote on the one I have. Husqvarna 1830EXLT, 1827EXLT Hands On Review. Premium “Crown Series” dual-stage units with a heavy-duty auger, high-speed impeller, heated handles and a standard LED headlight for greater visibility in less than favorable conditions. Track drive provides better traction with a unique tread pattern to reduce rolling vibrations. A heavy-duty hydrostatic transmission provides the power to get through deeper snow drifts. Hi….you guys still out there? I have a 0.4 mile gravel drive with 11% grade and parking areas. We have a plow but it’s old and I want a backup. I see your remarks about the Troy Bilt 3-stage. Would you still recommend it? or would you prefer a Husqvarna model? I’m in Newman Lake, WA near Spokane. Hi Jackie, I’m trying. Please be patient. Most people don’t realize that I have over 20,000 people visit my sites every day so answering questions can sometimes take a while. I appreciate all of the assistance Paul with narrowing down my decision. Have an enjoyable Holiday Season! I do appreciate your time with the follow up replies regarding the 3 stage and Dirty Hand Tools snowblower. To be 100% honest, my very first choice was the Husqvarna ST327T, but I am too frugal and was hoping to not spend that much money. I am also not mechanically inclined…I can change oil and spark plugs…so I not sure if there is additional maintenance with track driven snowblowers compared to wheel snowblowers. The hydrostatic transmission looks very appealing as well. Hi Randy, I like the ST327T a lot myself. There is no additional maintenance with the Husqvarna track drive. In fact there may be less maintenance over the years compared to a tire – it will never go flat and won’t wear out. The hydro is fun. Once you get used to it you don’t even have to stop the machine to go from forward to reverse. It you want a track that will last it’s one of the best choices on the market. I appreciate the quick reply and recommendation. I did look at the Troy Bilt 3 Stage earlier as well but was concerned that the front impeller might make a mess with the 4-6 inch snow falls we generally receive. I may have to wait until September 2016 to purchase unless you think that the 3 stage would work for the 40″ average of snow we receive in Sioux Falls per winter. So if you don’t mind starting in the middle of your drive and then going back and forth so that splattered snow always gets thrown to the outside, then you can clear your drive without leaving a mess. Other than the splattering it can do with the lighter snows I like the snow blower. It is a very dependable snow thrower. Troy-Bilt had a few 2-stage 28 inch in their warehouse in Sept I can’t find any left. What a great resource this site is. We are in Sioux Falls, South Dakota and moved into a new home after living in a place that removed the snow per the association. The new home has a 12′ wide driveway at 30′ of length with about a 12% grade. The front sidewalk is 4′ wide with the same 12% grade. We have 4′ wide sidewalks 132′ in the front and 132′ in the back. The top of the driveway is about 35′ wide and 30′ deep. My previous snow blowers in the 10 years prior to the association place were both two stage models. Lawn Boy 522R and Toro 1028 LXE. I am 46 and in fairly good shape at 6′ 1″ and 180 pounds. I am hoping that you can offer me suggestions on what would be a good snowblower for my situation. A couple of friends do not think I need a track driven snowblower. I agree the Storm Tracker 2690 is a wimp. The only reason I can figure out why Troy-Bilt makes that is because Lowes wants ANOTHER cheap snow blower. I also agree the ST327T and ST330T Husqvarna’s are over kill. The Cub Cadet 3X™ 30″ HD TRAC is also more snow blower than you need. What’s left is a track drive I highly recommend. It’s priced right at $1599, has the new style 3-point tracks and plenty of power for Sioux Falls drifts. Now, Lowes may be able to order it but I know this snow blower are getting to be in very short supply. Northern Tool still has a few. I don’t need to tell you that Nothern Tool is a great place to shop. Trust me – all you neighbors will be jealous when they see you out with this one. Hi Randy, I forgot to discuss the Dirty Hand Tools. Their snow blowers are 100% Chinese. My biggest problem with the snow blower is parts. Yes, DHT is a Colorado based company that makes great log splitters but snow blowers are new for them. Did they purchase a 20 year supply of parts for the machines or did they just buy a couple of containers of the snow blowers to see if they would sell? They list many repair centers on their site but every one of the repair centers I have contacted state they don’t repair DHT and in fact never heard of them.